It was a fun song to sing, but neither of us remember any Sunday school teacher of ours stopping to talk to us about what the song actually means. We encourage you to go on YouTube and play the song for your kids if you don’t already know it. What do your kids think their “light” is? If you asked your kids what they do that brings glory, praise and honor to Jesus, what do you think they would say? Have you ever told your little ones that saying “please” and “thank you” are ways to let their lights shine? Do your kids think how they treat and speak to their siblings and friends is letting their light shine? Do they realize every time they obey when asked to do something they don’t want to do and when they use self-control they are letting their lights shine? Every verse in every song means something. Let’s take a look at the rest of the verses in this song. How do your kids hide their lights under a bushel? Many parents were working on getting their kids to greet people who spoke to them at a family conference we were at recently. Not saying “Hi” to those you meet especially when they greet you first is definitely hiding their light under a bushel. When kids don’t turn assignments in on time they are hiding their lights under a bushel. When they don’t do their chores the way you have shown them or come when you call their name, they are hiding their lights. When they are not doing what they know is right, they are hiding their lights. James 4:17 says, “Whoever knows the right thing to do and fails do it, for him it is sin.” (ESV) Sin covers our lights. What is the difference between hiding their lights under a bushel and letting Satan blow it out? Giving into temptation is letting Satan blow your light out. For teens, when all the kids are going to a party where alcohol will be and your teens join in, they are letting Satan blow their lights out. When your 5th grader is seeking the attention of the popular girls at school instead of spending time with a child who is always on the sidelines, Satan has blown her light out. Satan loves it when your kids are absorbed in “Me, Me Me” because they aren’t putting the needs of others first. Sleeping in instead of having their Quiet Time/Devotions is a biggie for Satan too. Ask your kids to think about who they are giving the victory to, Jesus or Satan. 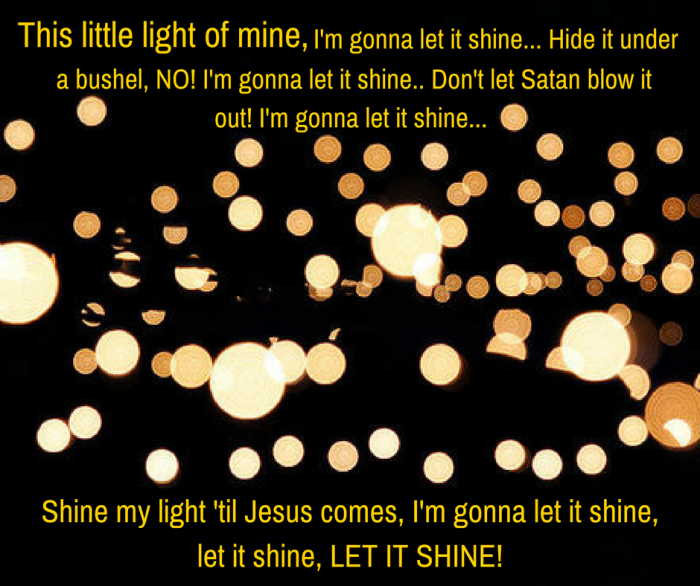 Shine your light ‘til Jesus comes. We hope your kids know Jesus is coming again. Until that day, it is every Christian’s responsibility to “Go therefore and make disciples…” (Matthew 28:19) One of the best ways to do this is to let the light of Jesus shine bright in our lives no matter our age!